First and foremost is our commitment to your satisfaction. Our philosophy is simple: We are not happy until you are. We understand that good business is based on satisfaction, referrals and repeat business. We want you to come back again and refer our site to your family and friends. Therefore we offer the following guarantee to all those that purchase from us. If you are not 100% satisfied with your purchase within 90 days of receiving it then return it to us for a full refund no questions asked*. Well OK we will probably ask you why you want to return it just so we can improve our business or product line-up if something is wrong, but that's all. We believe in the quality and value for money that our product selection represents. We want to know if you are not happy so that we can make adjustments if necessary to our product selection. We road test all the products we sell, video taping the results where possible, but there may be some slight configuration different to your specific situation. There is no benefit to anyone if people are not satisfied and we don't know about it. PLEASE NOTE: Our standard shipping method for all products is via Australia Post or USPS Express. If you require insurance (using registered post) then please order by phone or email us prior to ordering online so we can arrange the additional fees to cover insurance. If you do not indicate prior to ordering that you require insurance, then your order will be sent express post, with tracking, but WITHOUT insurance. b) Goods must be returned in an excellent condition. If the product has been opened Delonix Radar shall refund the retail price less the initial shipping costs to the customer and 10% of the retail price, which accounts for our bank charges, handling, testing, repacking and restocking of the product. Please respect goods that you return and include the original packaging. We are reasonable people and we expect that you are too. If any damage is found, no refund shall be provided, and the product shall be posted back to the customer. c) If the product is damaged in any way, neither the purchase price nor shipping charges will be refunded, whether purchased by direct-debit, cash or credit card, and the product shall be posted back to the customer. d) Guarantee does not extend to products designated as "shop seconds". These are goods that have been previously returned and are sold as is (normally at a discounted price) and may include other ex-display goods or floor damaged goods etc. e) Guarantee does not extend to "Veil anti-laser paint" if it has been opened by the customer. Also please note: Veil cannot be sent via air as it is an oil based paint. g) We reserve the right to refuse any and all refunds if we feel in our opinion that the buyer is exploiting this guarantee or is being unreasonable in any way. We want to provide you with the highest level of customer service at all times. If we do not meet your expectations, then TELL US! We can't improve our service if we don't know what's wrong. Let us talk through your problem, and try and find you the best solution. The customer is solely responsible for determining if a particular product is fit for purpose or not. Delonix Radar is not responsible for any claims, damages etc that occurs either directly or indirectly in relation to the customer's (or anyone else's) use of products purchased from Delonix Radar. Our liability will be limited to the purchase price of the product only. Delonix Radar do not warrant that any or all of the products advertised on this website are legal in your country or state. It is the customer's responsibility to determine if the use of any product supplied by is legal to possess and / or legal to own and operate. Furthermore, it is the customer's responsibility to ensure any goods on this website purchased are legal and permitted to be imported into your country or state. Delonix Radar is not responsible for the seizure of goods by customs if the product is illegal to import - please check the laws in your country prior to ordering! The information provided on the DelonixRadar web site has been compiled for your convenience. Delonix Radar makes no warranties about the accuracy or completeness of any information contained on this web site. DelonixRadar does not provide nor imply any legal advice or recommendations. All legal advice should be sought from a qualified legal firm. Delonix Radar , including its directors, affiliates, officers, employees, agents, contractors, successors and assigns, will not accept any liability for any loss, damage or other injury resulting from its use. Links to other web sites are provided for your convenience and DelonixRadar is not responsible for the information contained on those web sites. The provision of a link to another web site does not constitute an endorsement or approval of that web site, or any products or services offered on that web site, by DelonixRadar . 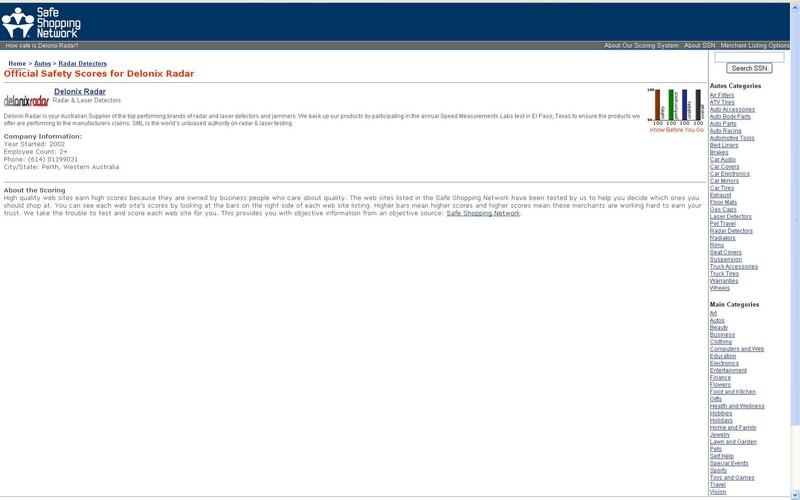 DelonixRadar will not accept any liability for the use of those links to connect to web sites that are not under our control. Delonix Radar , its directors, affiliates, officers, employees, agents, contractors, successors and assigns do not accept any liability for any damages or losses whatsoever, arising out of, or in any way related to, the use of this site and any other site lined to this site. The limitation on liability contained in paragraph 4 applies to direct, indirect, consequential, special, punitive or other damages that you or others may suffer, as well as damages for loss of profit, business interruption or the loss of data or information. DelonixRadar reserves the right to make changes, modifications, additions, deletions and corrections to the web site, at any time and without notice. Delonix Radar holds no responsibility to the legalities of use in your individual state or country These products are being sold in Western Australia, which currently has NO anti-radar detector laws. DelonixRadar supports safe motoring, and does NOT condone speeding or unssafe driving. a) All postage / shipping costs are not included nor covered under the warranty. The customer pays for the postage of goods either back to Delonix Radar, or directly to the manufacturer - which will be decided upon and advised by Delonix Radar. You must contact us first prior to shipping so we can assess the fastest method of fixing your problem. b) Once Delonix Radar has received a faulty unit, or the manufacturer acknowledges receipt of goods, we will either repair your product, or ship you a replacement unit - to be decided upn by Delonix Radar, with any postage or shipping at the customer's expense. c) Warranty does not extend to products that have been damaged by the customer, either directly or indirectly. The warranty only applies to product malfunction through normal use. So if you drop it, or have a car accident and your unit is damaged, this is not covered under warranty. For all other products the warranty is restricted to the manufacturers warranty (if any) as described on/with the product packaging. In the case of a supplied manufacturer warranty the goods are to be handled as per that warranty and returned to the manufacturer, not Delonix Radar. No other warranty is expressed or implied. Please let us know however if you have problems with manufacturer warranty and if we can help we will do so to the extent that we can, however no guaranteed resolution from our assistance is implied. These Policies, Terms and Conditions may change from time to time and without notice. Any amendments will be posted here on this webpage. We suggest that you visit our website regularly to keep up to date with any changes. If you have any questions about this privacy statement, the practices of this site, or your dealings with this Web site, then please contact us. Note: Delonix Radar, including its directors, affiliates, officers, employees, agents, contractors, successors and assigns do not condone speeding and will not be held responsible for anybody prosecuted for breaking the law. Delonix supports the use of radar detectors and similar devices for two reasons. Firstly, anyone who does a lot of driving is bound to unintentionally break the speed limit at some point because they are concentrating on the road and conditions ahead, rather than ensuring their speed is exactly (and not 1km/h over) the posted limit. Let alone that the speedometer is 100% accurate, or the cameras themselves are 100% correct (they are not). If police and politicians were genuinely concerned with drivers not exceeding the posted speed limit, they would make GPS speed limiters mandatory at a tax payers cost of only a few hundred dollars per car. They won't do this because it would lose them billions of dollars in revenue. Delonix feels you should be warned about your speed before you are prosecuted for a crime you did not intend to commit. Advanced warnings allow drivers to make an early decision to manage their speed of approach safely and smoothly. Secondly, speed cameras should be placed on dangerous roads, school zones, and in accident black spots to slow traffic down and catch the most reckless of drivers who do not have the skill to sensibly judge a dangerous stretch of road or are unfamiliar with the road ahead. If this is the case then these devices will give you advanced warning of possible danger ahead. Unfortunately cameras and police speed traps are usually placed on straight flat clear sections of road with no immediate danger or where the speed limit has recently been reduced with the sole intention of catching speeding motorists and generating fines. However, for those speed cameras placed correctly in accident black spots, a radar detector can give you advanced warning of danger on the road ahead.